Whenever Aroy-D comes out with a new product we pay attention, as the quality is always "Top Notch". This is the same company that pioneered the All Natural Coconut Milk which has been well-received around the world. This sauce has a fragrant, almost smoky rich sugary chile flavor that goes perfectly with spring rolls. We also carry Pantainorasingh brand (below). Everyone loves a good spring roll (see our Thai spring roll recipe), and a great sauce like this is more than the "icing on the cake". It makes your spring rolls the pinnacle of perfection. Packed in a large glass bottle, you get a very generous amount. Ingredients: sugar, water, red chilli, carrot, turnip, garlic, acetic acid, salt. This exotic sauce features shreds of carrot, turnip and spicy dried Thai chile seeds. 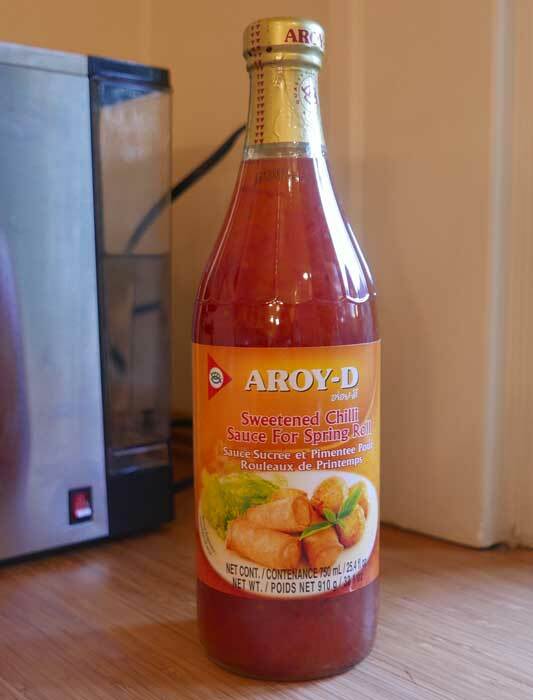 The perfect condiment for dipping fried spring rolls, fresh spring rolls, and/or Thai fish cakes. Also a great dipping sauce for barbeque chicken, this is a thinner sauce than our sweet chili sauce for chicken. High quality Pantainorasingh brand. Packed in glass bottle. Ingredients: sugar, water, red chile, turnip, carrot, salt, garlic, modified starch, acetic acid. Product of Thailand.